Psibindi is breaking fresh new ground in Psychedelic Trance, using her unique vocal ability to add a powerful human feeling to the music. Rena, a classically-trained Indian singer and accomplished psychedelic trance DJ is now making waves as a producer. She launched her brand new live tour in Summer 2016, performing on the main stage at Ozora Festival, and then on the Tribe of Frog stage at Boomtown. 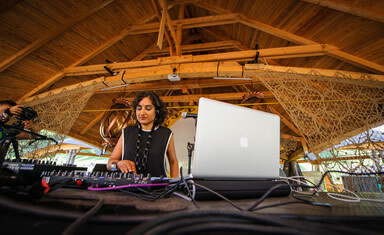 Psibindi’s new set comprises her live vocals, mixing and triggering FX, using a Native Instruments S5 Traktor Controller. Signed to UK-based label Aphid Records, Psibindi has had the privilege of working closely in the studio with psy-trance maestro, Aphid Moon, and multi talented producer, Mechanimal. Together they have created three successful EPs, Psychic Traveller, Binary Star and Elliptic, all of which have been critically acclaimed across the psy-scene. Rena has been busy in the studio, working with some top producers on a string of exciting releases planned for 2017. Psibindi is also a representative for Native Meetups: London, which is a new bi monthly event organised by music technology giants ’Native Instruments’. Psibindi is also the founder of Psy-Sisters; a global arts collective launched to inspire, promote and support creative women in the dance scene.